Poured from a 12 oz. bottle into a half-pint tumbler. A: Clear, light amber color with one finger of white foam head. Light lacing remains on the glass and a few eager streams of bubbles rise in the column. S: Mild and clean toasted grain as promised by the name, but comes across as a little under-attenuated, with earthy and slightly herbaceous hops. T: Begins off-dry, with honeyed pilsner malt and moderate acidity. Hop aromatics are grassy and slightly floral. Toasted, slightly caramel, whole-grain bread and dryness are more prominent toward the finish where bitterness remains restrained. M: Thin to medium viscosity, crisp and initially clean on the palate but turning sticky late, with moderate carbonation. D: A full-bodied amber lager somewhat comparable to Boston Lager, but with a more malt-focused presence. It brings to mind a personal favorite bottled lager: the (extinct) Golden Bear lager once brewed in Berkeley. A great, fresh beer to enjoy on a warm summer day. Has much more taste than your standard macro lager and is easy to drink. Enjoying now out of a 12oz bottle but tastes great at the Mets Citi Field out of a 160z can. Highly recommended if you want great tasting craft beer but don't like ales or IPAs. New York State, boyeee! The home of the Yankees, Mets, and obscene gun laws. Appearance (3.75) : Beige three fingered head, pillowy and large. The body is a toasted pecan color. 50% opacity. Aroma (4.25) : Mild hop, toasted pecan, rolled oatmeal, milled grain, faint hint of maple sap. It actually reminds me of Minnesota. A great bouquet, medium strength, I'm giving this a 4.25. Taste (4.25) : Wow. Can I say it again? Wow. This lager is fantastic. The slightly sour malt and hop hit unmistakeably at first, but what follows is a slight dark toast/roasted pecan flavor that sets in like a delicacy. It's like I ate a miniature pecan pie or something. Some faint hop left drying on the palate, but the pecan and nut flavors overwhelm it making it a nice finish. Extra note : there's a slight antiseptic/paint flavor to it floating in there somewhere, I can't put my finger on it. Perhaps it's just the alcohol fermentation of the yeast. The more I drink it, it disappears (so does the beer, unfortunately). Mouthfeel (4) : Zippy, then creamy, then roasted and dry. Light bodied within spec. Better than average for lagers. I'm giving it a 4. Overall (4.17) : I wish they sold this here. 302BeerGuy traded me this one and so far it's probably the most impressive lager I've tried outside of the midwest area. I really enjoy it, it's a fire-side, late night, cozy lager for sure. Poured this beer from a cold 12 oz. bottle into a lager glass. Appearance: Light brown with some tones of copper, good aeration and 1 finger of head. Aroma: Malts and barley all the way! Taste: Strong taste of toasted malts (not surprising considering the name of the beer) and some barley. Very light taste of hops in the background. Mouthfeel: Some lingering bitterness, but nothing to complain about. Bottom line: Probably won't buy this beer again after I finish this 6-pack...would be willing to try some of their others though. From 07/23/11 notes. Big thanks to SpeedwayJim for sending this one; thanks Jim! Poured from a 22 oz. bottle into a Duvel tulip. a - Pours a dark amber color with one finger of white head and moderate to high carbonation. Some light lacing on the glass and pretty good retention. s - Smells of toasted malts, caramel malts, anf light nuts. t - Tastes of caramel malts, nuts, bready malts, and some light fruit. A definite step up from the nose. m - Medium body and moderate carbonation. Smooth and creamy, and very easy to drink. o - Overall a pretty decent lager. Lots of toasted and nuts to it, would have it again. A smooth beer that balances flavor, malt, hops and grains. Creating a full bodied beer that amazingly feels light. Taste Rating in Words: Imagine a man relaxing on the log roll, he doesn't have to try and the log is spinning like a tire on the highway, take all this and roll it into a beer. Pours a light copper color with a one-finger head into my glass. 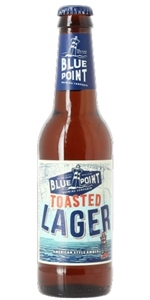 The name "toasted lager" makes me wonder if it tastes "toasted"? Sweet and dry with a good essence of bread-y malt. There's a good hop presence too. Dry with toasted malt and grassy hops upfront. Very refreshing. Crisp. Lingering toasted malt and grassy hops make up the mouthfeel here. Very nice example of the style. Takes a bit of getting used to, especially if you're expecting something lighter/grainier. A very solid lager offering, both winter and summer drinking. Easy-drinking and very little linger. The flavor is well-balanced and there is little to no hop bite. Also, very easy to find on tap or in a bodega in New York City. One of those beers you can drink one or ten! !